This spring we were lucky enough to stay at this gorgeous, newly-constructed home nestled in a sand dune just above the beach. I'm an architect, so of course I spent some time nerding out on the design and detailing in this home (and ogling a couple of architecturally significant nearby homes). The architect and builder both deserve a pat on the back for this one, the design is both functional and beautiful, the construction is masterful, and the interior decorating and appointments are tasteful and comfortable. The interior/exterior transitions are nearly seamless, there is so much natural light that I almost could have worn sunglasses inside, and the views of Monterey bay are awesome. Details like the radiant heating, roof deck, and outdoor surf shower are just icing on the cake. One small word of warning though, there is a lot of glass in this home, so privacy from the neighbors in certain rooms is somewhat limited… although there are no immediately adjacent houses (which is also a pleasure), and some well-placed drapes would certainly do the job. Here’s a recipe for vacation perfection: panoramic ocean views, luxurious finishes and furnishings… and nothing but sand dunes between you and the beach. White leather furniture graces the contemporary interior, with mesmerizing views and a double-sided fireplace. The dining room table seats eight, and the gorgeous modern kitchen sparkles with stainless appliances (Bosch and Jenn-Air), stone countertops, and an exquisite glass mosaic backsplash. The master has a King bed and curved glass windows; the en suite bath has two lavs, a deep tub, a private toilet compartment, and a walk-in shower with ocean views. Two other guest rooms with queen beds share a second bath with a tub/shower and a separate vanity area. There’s a den with comfortable sofas, a large screen TV, and an office alcove. Downstairs, a large bonus room acts as a fourth bedroom with two twins and a second office area with a desk. Nestled in the dunes, the exterior patios include a gas barbecue, a dining table for six, and chaise lounges for sunning. There's even an outdoor shower—and stairs to an upper level observation deck with views all the way to Santa Cruz. The setting is arguably Monterey’s most exclusive location: a cul-de-sac of spectacular new homes with direct beach access. Enjoy views across the Bay by day and city lights at night, accompanied by sounds of the surf to lull you into total relaxation. Stack washer/dryer. Two car garage. Modern kitchen (when you're not enjoying one of Monterey's fabulous restaurants). Multiple decks to enjoy "coastal living"
This house is in an upscale neighborhood with beautiful ocean views. In my opinion, it’s the most beautiful house on the block. The furniture is modern and comfortable. Appliances are high end and the views breathtakingly beautiful. The rooftop is furnished and adds one more advantage to this property. We had to call maintainance for a trivial issue and they came within hours. We will definitely be back. We have stayed at Costal Living twice. And I can’t recommend it enough. I almost hate to tell you how great it is because then you’ll book it and it might not be open when I want to stay there. We stayed for thanksgiving and then Easter. First time just our family and the next time we filled the house. It was very comfortable for so many people and we love the radiant heat. Michelle is easy to work with. Thanks again. Five stars. 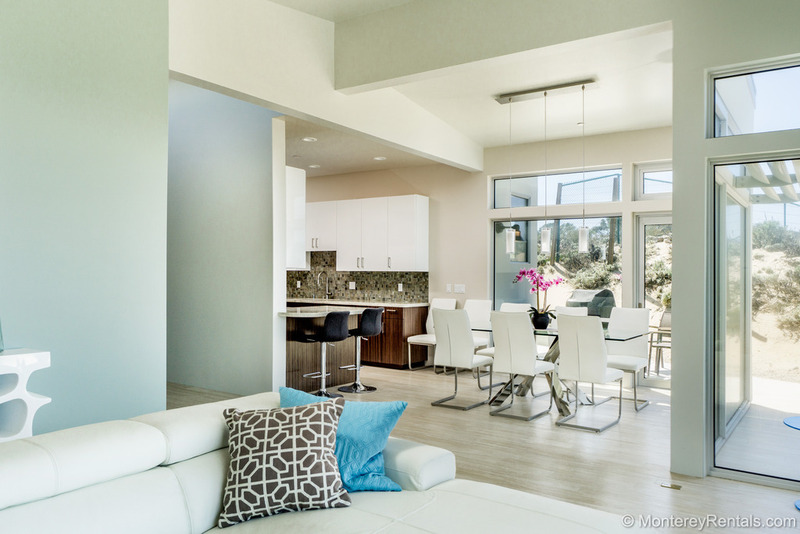 We had the great pleasure of staying in this brand new beautiful Monterey beach house in April. It is the last house on a cul-de-sac just a stone’s throw from the beach with breathtaking views of the Monterey Bay. It is architecturally stunning, spacious, and no detail was over looked when selecting fixtures and finishes. It is also very close to downtown Monterey. I can’t wait to come back and stay here next year!